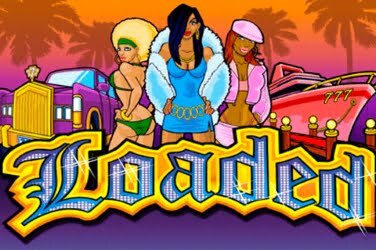 There is a Futuristic feel to this online slots where players find themselves in a control room surrounded by industrial machinery. Everything that they need to be able to set the 5 reels to spin while running the Power Plant and taking advantage of the Bonus Features on offer. 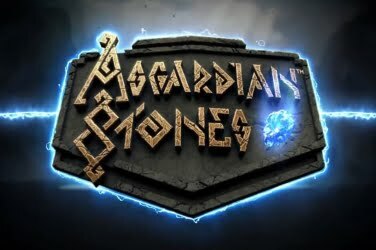 A different approach has been taken by the Yggdrasil when they created this latest edition to their online casinos. With this slots game players can opt to choose a 5×4 grid of reels or for an addition 0.30 coins they can see a 5×8 format to take advantage of. The reels seeming to appear from a machine at the top of the screen, lit in an electric blue with each symbol looking striking against its black background. It doesn’t matter what size screen that the player is using, whether it be via a Desktop, Tablet or Mobile device, thanks to the iSENSE 2.0 technology, as they will still find the same high quality graphics that this slots promotes. 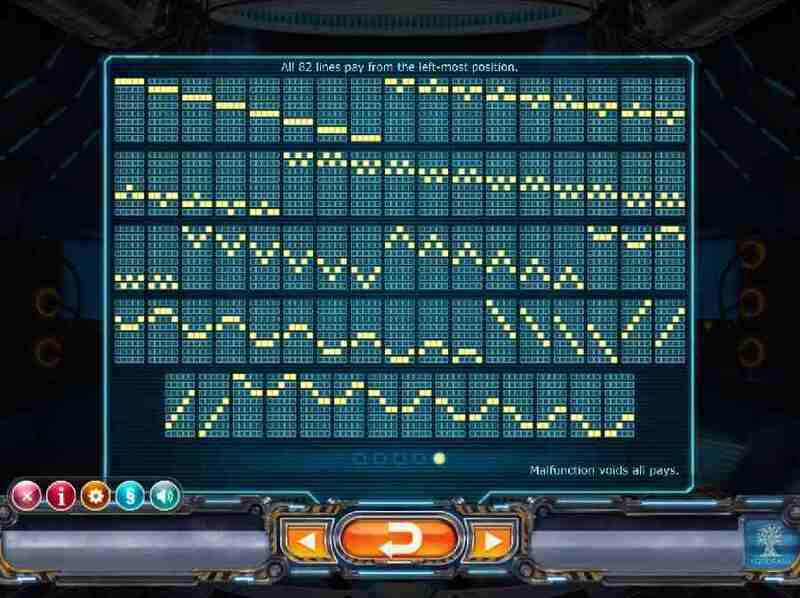 Although if using the 8 row format the “portrait” mode does add an additional twist to the gaming experience especially with the fun animations that have also been included in its format. 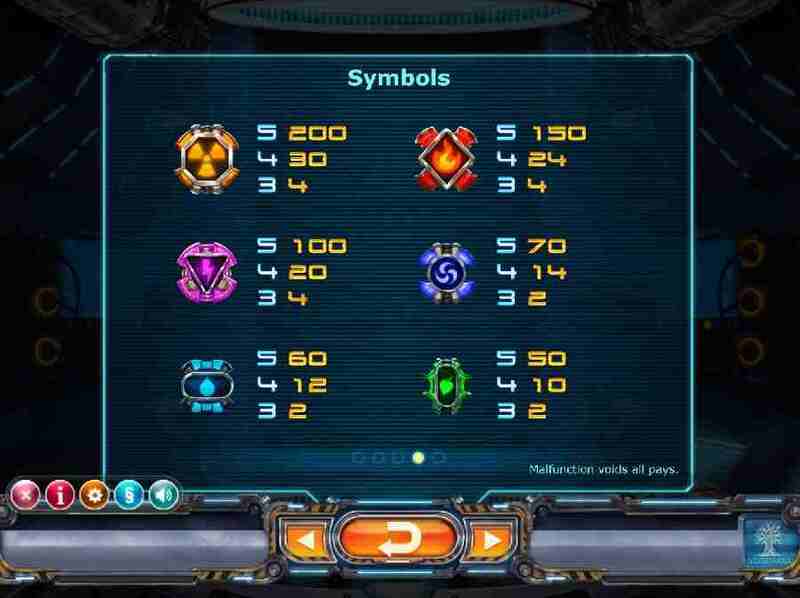 All of these depict some form of Power source which are brightly lit with different neon colors. Players can find symbols that include Nuclear, Fire, Lightning, Wind and Water which land regularly so that players have plenty of chances to add to their initial wagered amount. Wild – a large yellow “W” is the only symbol that provides players with more opportunities to create a winning combination. When it falls onto the screen it can change other symbols if a pay line can be found. This symbol will can also activate the main Feature of the game which is where the real wins can be claimed. 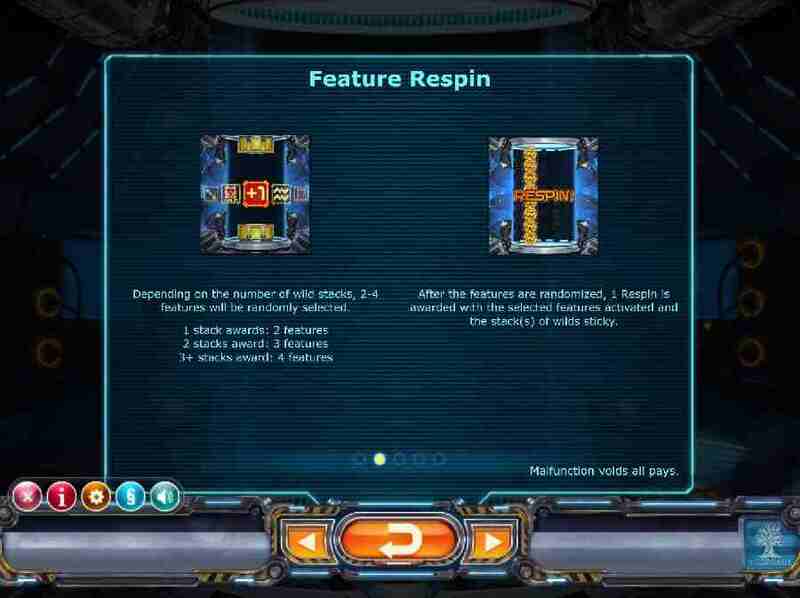 Wild Re-Spin – 1, 2 or 3, Wild symbols can land in a “stacked” position and will then fill the complete reel. 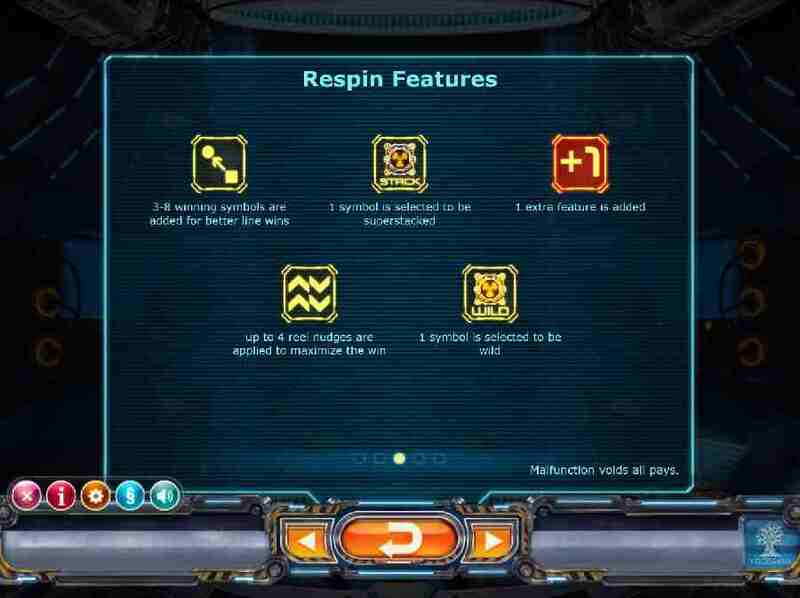 However the amount that fall does dictate how many additional Features are included during the 1x Re-Spin that is given at this point in this online slots. Not only that but those symbols that activated the round will “freeze” in place to allow for more winning opportunities. 1. Swapping Symbols – once the Re-Spin ends either 3, 4 or 5 extra matching symbols are added to the reels to create a guarantee win for the player to see add to their final jackpot balance. 2. Nudge Reels – now the players can “nudge” the reels up to 4x to give them more chances of locating a winning pay line. 3. Super Stack – 1 random basic symbol will heighten its position to become “stacked” for further chances for players to win. 4. Active Wild – a “W” Wild symbol replaces another icon on the screen to provide players with another win if they are lucky enough. 5. Extra Feature – this is when an additional Feature is included if the player doesn’t already have the maximum 4 that are allowed. Yggdrasil have given players various options with their latest release so it can be appealing to players of any level. The coin denomination ranges between 0.50 and 100.00 with each spin but there are either 4 or 8 rows upon which wins can be found depending on the player’s budget and how much they prefer to risk. 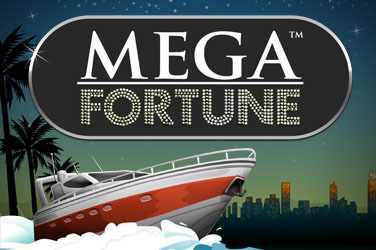 There may not be a Scatter symbol for players to reach a Free Spins Bonus Round in this slots game. 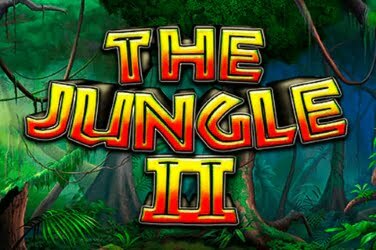 Neither will players find a Progressive Jackpot, Gamble Feature or any Mini-Games to add any further thrills during the ground. 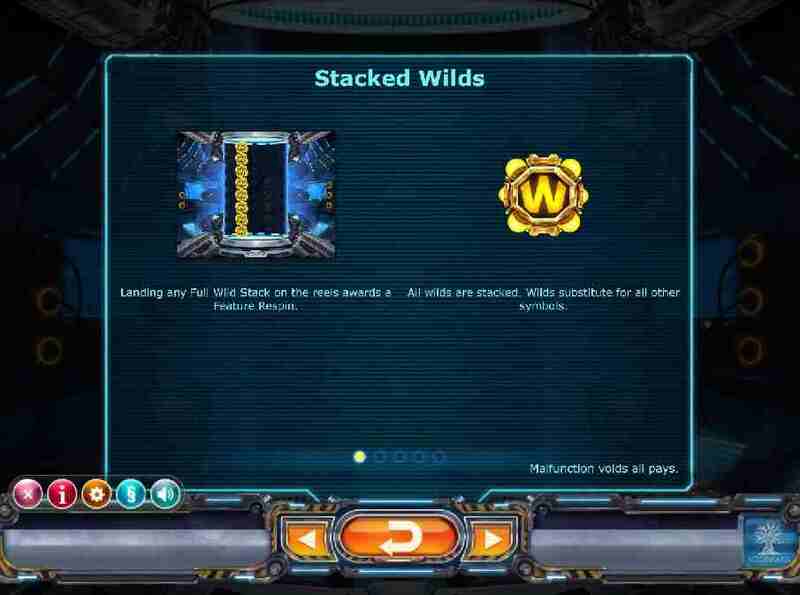 However the yellow “W” Wild not only provides more winning chances it also has 5 different Bonus Features that players can take full advantage of as the reels spin. An Auto-Play button can also be pressed at any point during the game should the player need to be away from the screen. Leaving the reels to spin automatically while they are busy doing other things in the hope of returning to see a healthy profit on the initial amount that they wagered. 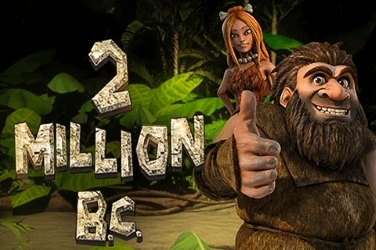 This online slots offers a RTP of 96.10% and is considered to be a Medium variance game. 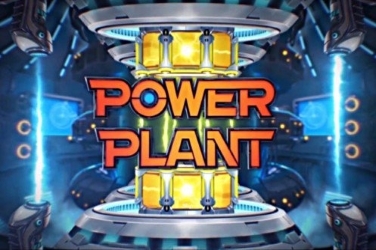 Factors that have proven appealing to both high and low rollers since the Power Plant slots game was released and it is sure to be enjoyed by anyone who appreciates the unique format that Yggdrasil have created.